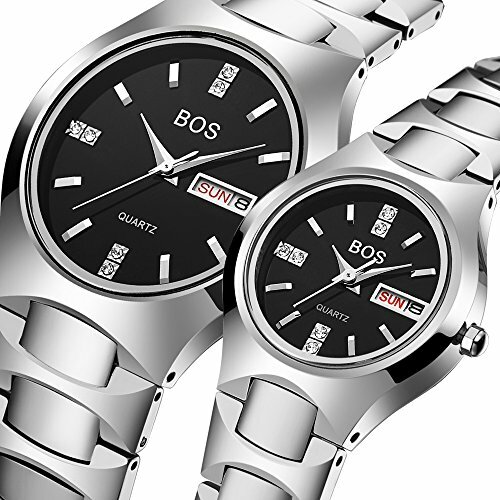 Life is not only made of time, and BOS is not just only a minutes & seconds. BOS is with you, Enjoying the pleasures of forgotten time in life, bearing in mind an instant moment of eternity. Quartz movement, Week and day window at the 3 o'clock. High hardness of synthetic sapphire crystal surface, anti scratch/resist compression. Fold clasp, easy to use and comfortable. Best Present - Best choice as a gift for wedding,anniversary,Valentine's Day,Christmas and other meaningful days. Give her/him a surprise right now. Water resistant to 165 feet (50 M),Withstands rain and splashes of water. If you have any questions about this product by BOS, contact us by completing and submitting the form below. If you are looking for a specif part number, please include it with your message.